As mentioned in a previous entry, when they left Mr. O and family took the curtain hardware with them. They weren't supposed to do that. 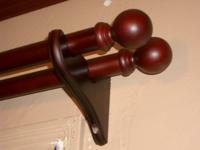 Curtain hardware is considered part of the house. Mr. O's realtor said to send her a bill for the new hardware. Frankly I wanted the old hardware back. It was awefully pretty. That and it was already picked out. I have been known to suffer from "analysis paralysis." Given a lot of possibilities I will endlessly consider the options and deferr a decision indefinitely. Especially when they're all so lovely.